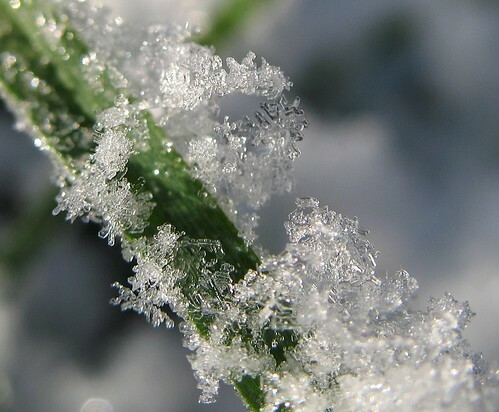 Snowflakes in my garden this morning. The first snow to settle this winter (spring?). 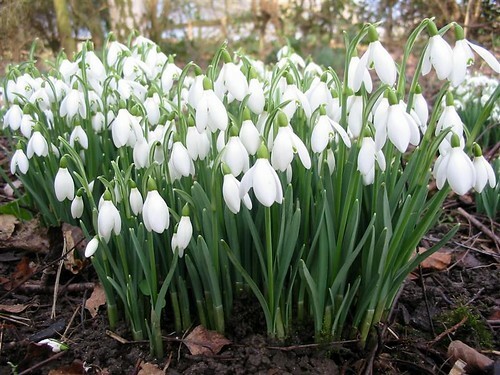 Spring flowers are well and truly here now. 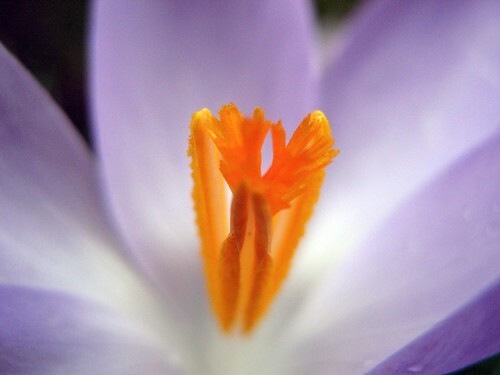 Somehow the crocuses are surviving the battering by the persistent rain and are adding their cheerful gaudy colours to gardens and verges. 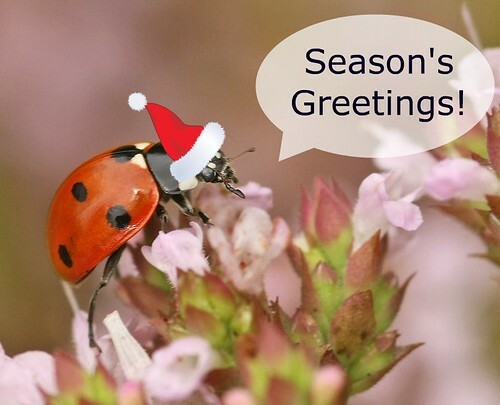 Unfortunately at the moment I’m feeling about as grotty as the weather, so not much happening here on my page. This week is our Half Term break from school. My Mum and Aunt are visiting for a few days – so I’ve dragged them with us to a couple of nature reserves. 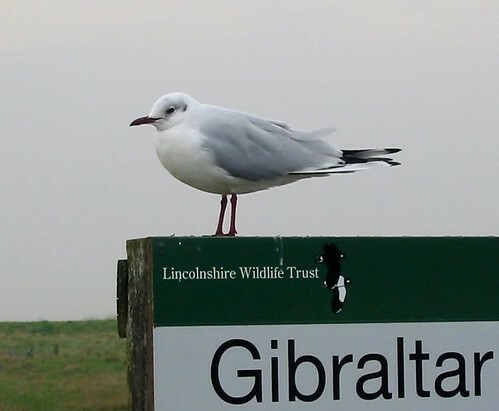 Yesterday we spent a happy day over at Gibraltar Point, which sounds rather exotic but is in fact located just to the south of Skegness on Lincolnshire’s bleak and bracing coast. It’s a wonderful place, although during the week the tranquility is frequently shattered by RAF planes using the Wash ranges. Far more welcome are the calls of curlews – this is a great place to them too. Unfortunately, the tide was out whilst we were there so I wasn’t able to see many birds at close quarters and had to rely on binoculars (and even then couldn’t distinguish between the various small brownish waders well enough to put names to them). Next to one of the bird observation huts I noticed a wonderfully shabby small concrete shelter that I’d peviously overlooked, with peeling, weathered, blue and green paint. 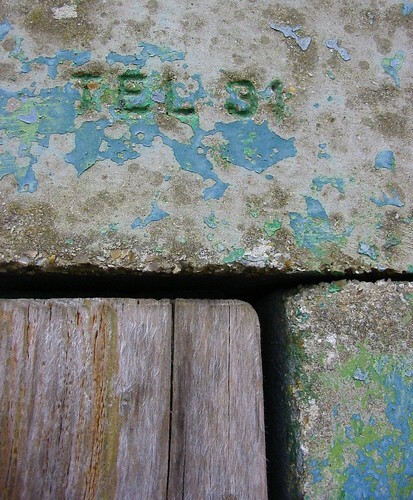 In the concrete, over the door, were the words “Skegness Cast Stone Works Tel 31”. How long has it been since two-digit phone numbers? Google didn’t instantly come up with any information about the stone works company, but I think I’ll rummage a bit more and see what I can uncover. 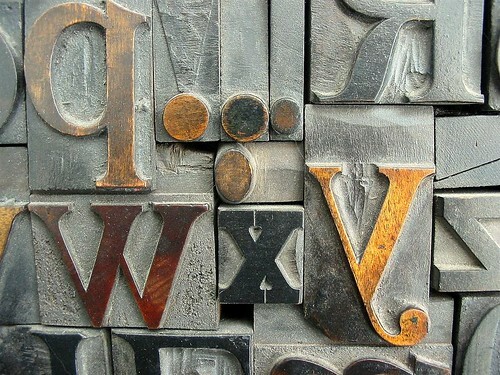 Years ago I acquired, at a local junk shop, a rather crudely assembled collection of wooden type within a frame. I love the colours and textures and this morning I thought I’d have a go at photographing it. 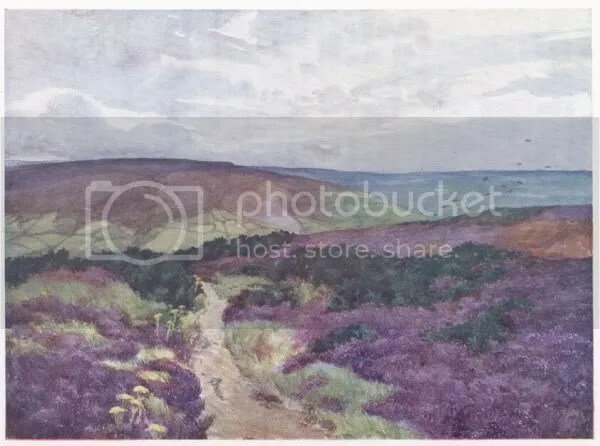 This (unfoggy) moorland scene is from ‘Yorkshire Coast and Moorland Scenes’ by Gordon Home (1904). The book is available free on Project Gutenberg. 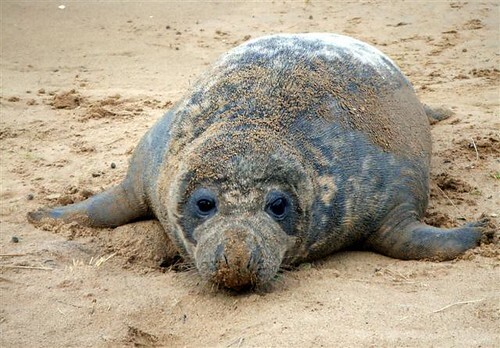 If you happen to be in the Lincolnshire area over the next couple of weeks or so, now is a great time to visit the National Nature Reserve at Donna Nook to see the grey seals pupping and mating. The seals haul out on the beach and many sprawl extremely close to the footpath, offering a fantastic opportunity to observe them at close quarters. Grey seals, Halichoerus grypus, are among the rarest seals in the world: the UK population represents about 40% of the world population and 95% of the EU population. So far this season about 950 pups have been born at the Donna Nook colony – pupping action will peak there by mid-December. The pups are suckled for three weeks, during which time their weight triples and they gradually lose their cream-coloured coat. Once weaned, the pups are left by the cows – who are now ready for mating. By the end of January the seals will have left the beach and moved out to the sand banks. Happibun has another account of our day out. 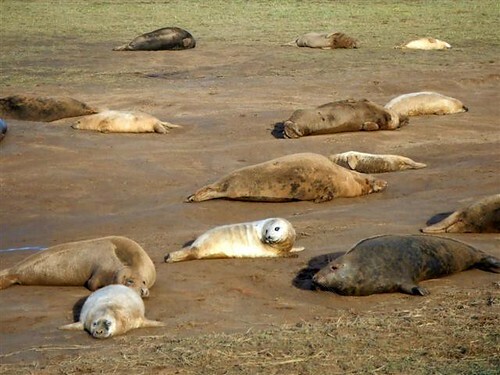 She describes some of the hazards of seal-watching at Donna Nook – crammed carpark, decidedly nasty caterpillars, non-existent toilet facilities (I was ok; didn’t get the urge) and more… It’s an absolutely brilliant experience! For a look at grey seals mating and pupping (elsewhere in the UK, though) Seal Diary from the BBC has plenty of information and video clips – great for getting a feel for what it sounds like. Gerhard Schulz has a nice collection of wildlife photography – including a gallery of grey seals – if you want more professional seal photos than the ones I managed! This evening we went out to the local Indian restaurant to celebrate Happibunlett’s birthday. Stacks of great food – and I’m still puzzling as to how the youngsters were able to find room afterwards for some seriously chocolatey birthday cake! I left woolyjumper at Happibun’s house, where he is sleeping-over. I don’t think much sleeping is going on, though, if the stumbling activity is anything to go by! The birthday meal was quite a gathering of stumblers! Woolyjumper has got the stumbling bug again, after a summer spent playing outdoors or satisfying his Runescape addiction, and is back adding to his blog. Check out his cute animal pics and other things that have caught his 12-year-old’s eye. My daughter has just joined us here as polarpup. There’s not much on her page yet, but I’m sure she’d like to see you visit!